David has been imprisoned in New York State since 10/20/81, when a unit of the Black Liberation Army along with allied white revolutionaries tried to get funds for the struggle by robbing a Brinks truck. This tragically resulted in a shoot-out in which a Brinks guard and two police officers were killed. David is serving a sentence of 75 years (minimum) to life under New York State’s “felony murder” law, whereby all participants in a robbery, even if they are unarmed and non-shooters, are equally responsible for all deaths that occur. 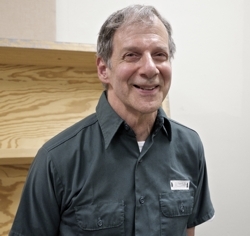 While in prison, David has been actively involved in the struggle against AIDS, and has remained a staunch opponent of oppression still dedicated to human liberation. He is also a longtime advisor and collaborator in the annual Certain Days Free Political Prisoners Calendar project, and the author of two books, and several pamphlets. David’s most recent book is entitled Love and Struggle: My Life in SDS, the Weather Underground, and Beyond. Released by PM Press in 2012, it was greeted by very positive reviews from both the movement and mainstream press. Videos of book launches, and reviews from progressive publications, can be viewed below. Naomi Jaffe introduces the event “Weather Underground Meets Occupy Wall Street” on March 3, 2012 at The Sanctuary for Independent Media in Troy, NY. Victorio Reyes reads a selection from “Love and Struggle” during the event “Weather Underground Meets Occupy Wall Street” on March 3, 2012 at The Sanctuary for Independent Media in Troy, NY. Panel at Brecht Forum discussing Love and Struggle; Kazembe Balagoon (standing; facilitator), Kenyon Farrow, Monifa Bandele, Terry Bisson, Alan Grieg, Aazam Otero, Matt Meyer.